The Criterion Theatre, hidden under London’s Piccadilly Circus, is a glorious relic of Victorian excess. From the faded red velvet curtains to the cherubs that spill across an extravagantly ornate ceiling, the decor is an intriguing mix of gaudy music-hall glamour and opulent high aestheticism. The onset of slight shabbiness only adds to its antiquated charm. Practically and stylistically, the venue is also perfectly suited to Fiery Angel’s wonderfully inventive reimagining of The 39 Steps. The play features two scenes in a London music hall, allowing the staging to open up into the auditorium and involve some tongue-in-cheek audience participation. Moreover, the surroundings lend themselves to director Maria Aitkin’s evocation of a once wealthy London in post-WWI decline, and to the production’s bawdy, theatrical brand of comedy. The plot draws heavily on Hitchcock’s 1935 film, rather than the earlier novel. Returning to Blighty from a stint overseas, quiet-living über-Englishman Richard Hannay (Andrew Alexander) finds himself wrongfully accused of murder and embroiled in a treasonous plot. On the run, searching for the truth and inconveniently chained to a disobliging blonde, Hannay is pursued from London to the windy Scottish highlands by inept police, corrupt officials and a stern Scottish farmer with an impenetrable accent and a lustful young wife. Catherine Bailey plays all three love interests – with enough skill that it took me a while to realise this – whilst all other roles are handled by the hilarious Stephen Critchlow and Ian Hughes. Much of the humour is drawn from watching the pair switch rapidly between villains, newspaper sellers, milkmen, train passengers, B&B owners and more, occasionally even conducting conversations with themselves in the process. In one memorable scene, A nightie-clad old lady (Critchlow) argues with a policemen at the door (also Critchlow), before spinning round to continue the argument as the policeman and revealing a completely different costume on the other side of his body. The production fully embraces these farcical elements, frequently making self-conscious jokes about the limitations of the props and set and, in an intriguingly post-modernist twist, actually scripting in mistakes and late cues for added comedy. Despite poking fun at the mock-simplicity of the set, the technical elements of the production and the ingenuity of the cast, director and set designers are evident. The shadow-puppet sequences that replace complicated chase and crowd scenes are amusingly childlike, but also perfectly realised and surprisingly effective. At the heart of the production is a wry reference to the artifice essential to ‘realist’ theatre (and film) and a refusal to allow the audience to engage fully with this artifice. In doing so, the production frustrates any attempt to become emotionally vested in the play – tension, empathy, relief are all dissipated by the reminder that what we are seeing is blatant construction – but it does make for very entertaining viewing. 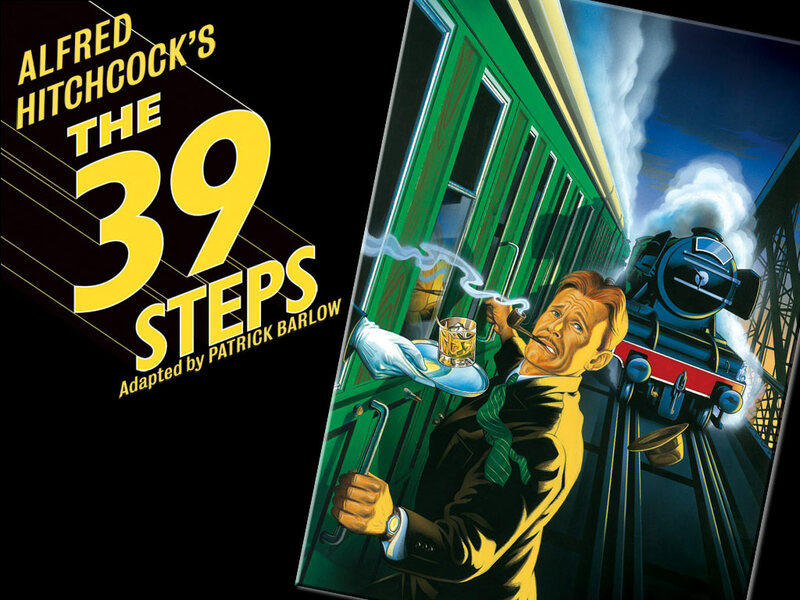 For all its slapstick silliness, The 39 Steps provides a sophisticated comic reaction to immersive drama; one in which the puppets wilfully point out the strings.